With the growing popularity of vessel sink fixtures in bathroom vanities, more and more people are looking to install vessel sinks. Whether you are putting in new countertops or installing the vessel sink in an existing one, this is a relatively simple task for someone who has some plumbing and carpentry skills. If you need to put in new water and drain lines, you may want to seek the help of a professional plumber. Otherwise, choose the vessel sink that fits the opening in your countertop and install it. Install a vessel sink in your bathroom. 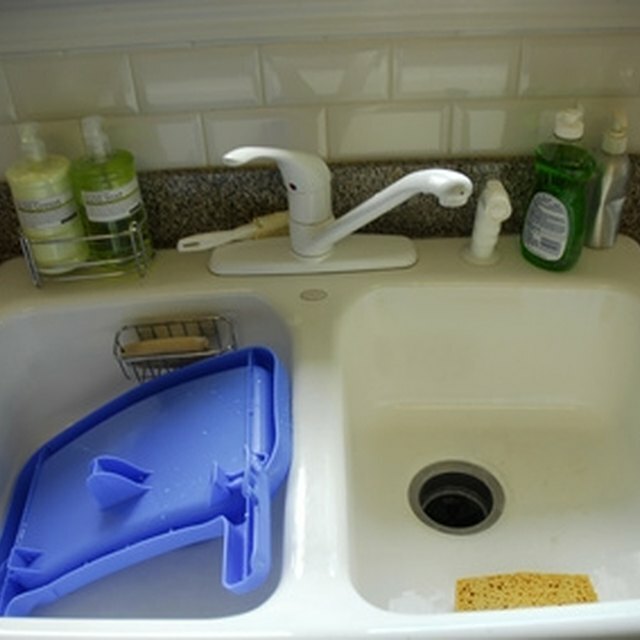 Examine your vessel sink to decide if it should set directly on top of the countertop or if you can install it partially below the countertop. (See References 1) Vessel sink fixtures set into the countertop have more stability over time because they have more support. One setting on top of the countertop has the drain fixture and some silicone caulking holding the bottom of the vessel in place. Putting a vessel sink on top of the countertop may put the sink at an uncomfortable height for use as well. Measure your vessel sink against the holes in the vanity countertop for the plumbing fixtures to make sure everything is going to fit. The vanity countertop you choose needs to have holes for the plumbing fixtures as well as a hole for the vessel sink's drain. If you are drilling the holes in a solid countertop, make sure you can cut the countertop material easily. Some materials require special tools and are hard to cut. Make a cardboard template of where the holes need to be and drill them. (See References 2) Check that the holes line up properly. If they don't line up, make fine adjustments so that they do. Install the vanity and countertop. Secure them to the wall and floor. Put the drain fixture in place on the vessel sink. Tighten it by hand. Be careful not to crack the vessel sink. Run a bead of silicone caulking around the opening for the sink's drain on the countertop for an above-counter sink. If your vessel sink came with a connecting ring to serve as an additional cushion for sink, set it in place. Put the vessel sink on the connecting ring and silicone caulking. Check to make sure the vessel is level. To set a recessed vessel sink simply set the vessel sink into the hole in the countertop. Caulk around the edges. Install the faucets. Connect the water lines as well as the drain lines to complete your project.